1992 Consensus: Why is the agreement important to Beijing and Taipei? Why Is the 1992 Consensus So Important to Beijing and Taipei? 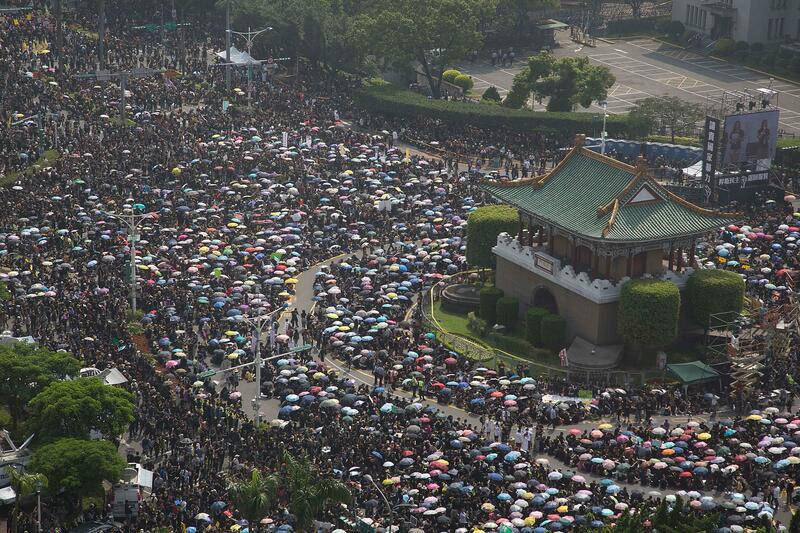 Thousands of protesters attend a rally called by student groups occupying the Legislature Yuan on March 30, 2014 in Taipei, Taiwan. The protesters oppose a trade agreement with China. The 1992 Consensus is a very important milestone that affects relations between Beijing’s People’s Republic of China and Taiwan (official name of the government is the Republic of China). After the PRC started opening up in the late 1970s and Taiwan’s investors started moving into China, it became clear that Beijing and Taipei needed a mechanism to start talking to each other. But there was a major problem: The two sides did not recognize each other. This was because both Beijing and Taipei claimed to represent all of China. In order to get around this problem with official dialogue, both Taipei and Beijing created “unofficial” organizations to talk to each other. (I use quotes because although they are officially “unofficial,” in fact they do not act independently of their respective governments in Beijing and Taipei.) These associations became what are sometimes called white-glove organizations—both governments could claim that the organizations did not represent them, but at the same time, they established a bridge through which they could handle day-to-day issues. Now, Beijing’s official goal has always been to bring Taiwan under the control of the PRC. Beijing’s official line is that the “one country, two systems” setup that was applied to Hong Kong can also be applied to Taiwan. It insists that even after Taiwan’s political unification as a part of the PRC, the lives of the Taiwanese would not be affected. Taiwan rejects the “one country, two systems.” So far, it has not offered a counterproposal. As for the official line of the government in Taiwan, while it does not make any claims to “recover the mainland” and disband the Communist Party, it still has not agreed to lay aside its claim to represent all of China. Domestically in Taiwan, there is a strong opposition that does favor independence for Taiwan, which is called the Democratic Progressive Party, or DPP. The DPP has placed Taiwan independence into its party charter and even on its party flag and logo. When the army of the Republic of China withdrew to Taiwan in 1949 under the leadership of Chiang Kai-shek and his ruling Kuomintang Party, or KMT, Chiang swore that he would eventually return to mainland China to re-establish the Republic of China. He died in 1975 without fulfilling this promise. In the meantime, native Taiwanese established their own party (the opposition DPP) and rose within the ranks of the KMT. On the death of President Chiang Ching-kuo (Chiang Kai-shek’s son) in 1988, a native Taiwanese, Lee Teng-huei, became president. Lee was caught between two opposing forces: As a KMT member, and later becoming chairman of the party, he inherited Chiang’s commitment that the Republic of China represented all of China. As a native Taiwanese who had never visited mainland China, he felt no connection to mainland China. Moreover, Lee became the first directly elected president of Taiwan in 1996. This meant that his opinions needed to reflect those of voters in Taiwan. Both sides agree that there is only one Chinese nation comprising all of mainland China, Taiwan, Penghu and the offshore islands. Under this Chinese nation, there are two states. Both sides agree to disagree on the definition of control of these two states. Basically, both sides agreed that the other side existed, but they would disagree about everything else. But there was one part in it which was very important, and which most observers miss: Both sides agreed that Taiwan belonged to China, while continuing to disagree on which China. As time passed, this came to be called the ‘92 Consensus. This brings us to the next question: Why is the ‘92 Consensus important? As noted earlier, the leading pro-independence party in Taiwan is the DPP. Its position is simple: Taiwan does not belong to any China because Taiwan is Taiwan. It should be an independent country recognized by the whole world, including Beijing. Beijing strongly rejects this view and has repeatedly threatened the use of force if Taiwan becomes independent. To further complicate matters, the U.S. passed the Taiwan Relations Act, which has promised the use of American forces to defend Taiwan in the event of attack from Beijing. But what happens if Taiwan unilaterally declares independence from China, thus provoking an attack from the PRC? Would the U.S. defend Taiwan then? So far, the U.S. has been unwilling to clarify its position. Now, the ‘92 Consensus is used as a litmus test by Beijing. While many in the DPP say that they do not accept the ‘92 Consensus, this has not become the official position of the DPP. So, after the success of the DPP in the November municipal elections, Beijing has turned to asking individual DPP members who have been elected if they accept the 1992 Consensus. Basically, Beijing is getting prepared for the KMT to lose the presidency in 2016. If each individual candidate says that he or she accepts the ‘92 Consensus, then Beijing will talk with him or her, but if he or she refuses to accept the ‘92 Consensus, then Beijing will not talk with that candidate. But even if a DPP candidate is elected as president of Taiwan in 2016, he or she will face a strongly divided party, with some favoring outright independence for Taiwan and all the uncertainty that brings, while others will advocate improved ties with Beijing. Beijing feels that as long as a DPP elected official advocates improved ties with Beijing, he is someone Beijing can deal with. Beijing is betting that Taiwan cannot get around its dependence on the PRC market and economy. Taiwan: Why do so many people from Taiwan dislike being called Chinese? Politics of China: Why is it that a lot of Chinese people don’t feel oppressed by their regime? China: As a Chinese native what is your number one favorite thing about China?